The Adler Planetarium and the Adler Women’s Board are delighted to announce our annual Women in Space Science Award Celebration, which will take place on May 16, 2019. This annual celebration recognizes the life and accomplishments of trailblazing women in the fields of science, technology, engineering, and math (STEM). The luncheon will feature a keynote address by the honoree, Peggy Whitson, followed by a discussion between Dr. Whitson and the Adler’s President and CEO, Michelle B. Larson, PhD. Proceeds from the event support the Adler’s STEM education programs and empower young women in the Chicago area to achieve their dreams in science and space exploration. Interested in being becoming a sponsor? View our 2019 Women in Space Science Award Celebration sponsorship opportunities. Please contact development@adlerplanetarium.org with any questions. Peggy A. Whitson, PhD, is a biochemist, a retired NASA Astronaut, and a world record holder in spaceflight. A veteran of three long-duration missions aboard the International Space Station (ISS), this trailblazing Iowa native has accomplished several “firsts” and broken space endurance records over the course of her career. 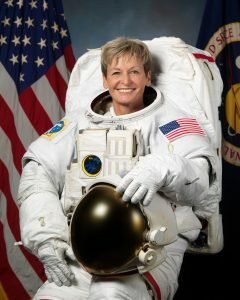 She was the first woman to earn the role of astronaut chief, to command the ISS twice, and with a total of 665 days in space, Dr. Whitson holds the U.S. record, placing eighth on the all-time space endurance list. She also has lived in space longer than any woman world-wide. Dr. Whitson completed a career total of 10 spacewalks, another first, and the current record for women. During her final mission, Expedition 50/51/52, she broke the world record for single flight duration, 288 days. On Thursday, April 24, 2018, the Adler Planetarium presented the 2018 Women In Space Science award to Dr. Rosaly Lopes. Dr. Lopes is a planetary geologist, volcanologist, an author of numerous scientific papers and several books, as well as a proponent of education. The celebration concluded with a private afternoon program for approximately 250 young women from Chicago-area schools.